First class buses are the only option provided for visitors departing from Pattaya Bus Terminal. The ticket price is shown at the counter, so no one can take advantage by over-charging innocent visitors. The first class buses in Pattaya also do not stop over many places, to pick up passengers on the way as the second class buses. Visitors therefore will not get any frustrated from that kind of incidents. Note that for those who go to Mochit 2, or Sai Tai, Bangkok, the buses will be stop over at Aou Udom. Visitors also do not have to be concerned about getting around Pattaya City by the transportation provided. Everything is managed for support visitors at the terminal. There are always several Song Thaews and motorcycle taxis that are ready to take care of any visitors since the arrival. Visitors can therefore easily go to a hotel, shopping center, clubs, or wherever they want to be around the city. 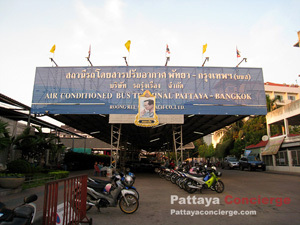 As any standard bus terminal, even though Pattaya Bus Terminal is not a large one, it can be divided into 4 major areas. In front of the terminal, there is a location for transportation to the city as mentioned above. Next to this connecting transportation, it is the ticket counter. Visitors can queue there to buy a ticket to Ekkamai, Mochit 2, or Sai Tai. When going a little further in the terminal, visitors will find a passenger area to wait for a bus. Around this area, there are a few small shops to support visitors, including a bookstall. Eventually, at the deepest location of this small terminal, there is a paid toilet to support visitors, where you need to pay about 3 Baht at its entrance. Departure Time Every 30 - 40 Min. Last: 9PM Every 30 - 40 Min.